World Water Week: The Relationship Between Water and Food. the wars of this century will be fought over water. World Water Week is sponsored by the Stockholm International Water Institute and is being conducted this week in Stockholm. World Water Week provides a unique forum for the exchange of views, experiences and practices between the scientific, business, policy and civic communities. It focuses on new thinking and positive action toward water-related challenges and their impact on the world’s environment, health, climate, economic and poverty reduction agendas. This year’s program is focused on Water and Food Security. According to the SIWI, water interventions for food security, at production and household levels, need to focus on improved nutrition, better health, critical bio-diversity and sustainable livelihoods, achieving co-benefits for environmental as well as human health. Wonderwater: An initiative to educate and inspire. One group that is pioneering the campaign to raise awareness about the relationship between water and food production is the U.K. based Wonderwater.They have created public awareness campaigns and interactive learning opportunities to help educate people about the food and water. 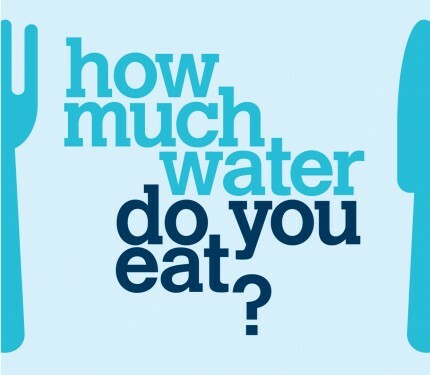 How much water do you eat? This is the question posed by Wonderwater to consumers, businesses, politicians and NGOs around the world, as the pressures of population growth, climate change and water scarcity continue to pose serious challenges to our future food security. The group uses creative, thought-provoking design exhibitions and striking café installations to stimulate conversations relating to the water footprint of food, prompting visitors to consider how much of the world’s scarce fresh water (which represents just 3% of Earth’s water) are required to produce the food we consume. Wonderwater’s latest project is another of its Wonderwater Cafe’s. In September 2012 Wonderwater Cafe will arrive in London at Leila’s Shop in Shoreditch. Leila McAlister’s responsibly sourced and seasonal menu will be utilized to illustrate how much water it takes to produce our favorite foods, and highlight the importance of considering water consumption when making culinary decisions.